Habit: Perennial herb from caudex or rhizomes, generally glabrous; dioecious or flowers bisexual. Stem: 1--few, generally erect; branches 0 or few. Leaf: 1--4-ternate or pinnate, basal or basal and cauline, alternate, generally reduced distally on stem; leaflets wedge-shaped to +- round, entire, crenate, or lobed; pale green abaxially, generally green adaxially. Inflorescence: raceme or panicle, axillary or terminal, generally erect, +- scapose or not; bracts simple to 1-ternate; pedicels generally erect in fruit. Flower: sepals 4--5, +- green-white to +- purple, petal-like or not, generally early-deciduous; petals 0; stamens 8--many, generally > sepals, filaments flat or generally thread-like, anthers generally narrowly oblong, tip generally pointed; pistils (1)2--22. Fruit: achene, compressed laterally or not, ribbed or veined, beaked. Habit: Plant 60--200 cm; generally dioecious. Leaf: basal and cauline, 7--46 cm; segments 8--20 mm, glabrous to finely glandular-puberulent. Inflorescence: panicle, bracts leaf-like proximally. Flower: sepals generally 4, 2--5 mm; stamens 15--28, filaments thread-like, anthers oblong-linear, acuminate. Fruit: 7--20, spreading to ascending; body 4--8 mm, +- compressed laterally, sides obliquely +- ovate or +- widely obovate to +- round, ribs 1--3, +- curved, veins 0--several, beak 1.5--4 mm. Note: Plants in NCoR occasionally with bisexual flowers; varieties in California difficult, need study. Leaf: distal abaxially generally finely glandular-puberulent (at 20×). Fruit: body +- compressed throughout, sides obliquely +- ovate to +- obovate, 2--3-ribbed, veins 0. Chromosomes: 2n=28,56,70. 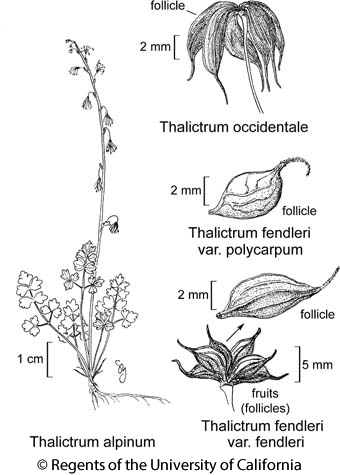 Citation for this treatment: Bruce D. Parfitt & Dieter H. Wilken 2012, Thalictrum fendleri var. fendleri, in Jepson Flora Project (eds.) Jepson eFlora, http://ucjeps.berkeley.edu/eflora/eflora_display.php?tid=67036, accessed on April 24, 2019. KR, CaR (uncommon), SN, SnFrB, SCoRO, TR, PR, GB; Markers link to CCH specimen records. Yellow markers indicate records that may provide evidence for eFlora range revision or may have georeferencing or identification issues. Purple markers indicate specimens collected from a garden, greenhouse, or other non-wild location.